A recent reader asked, “why is my iPhone stuck in headphone mode?” Apparently, the iPhone thinks headphones are plugged in when in fact there are none. To assist, we decided to write an article about the fix or solutions. Hence, in this post, we discuss how to fix an iPhone that’s stuck in headphone mode. An image that shows the iPhone volume setting stuck on headphone mode. Settings, Sounds & Haptics, then to Ringtone. Select different ringtones and see if your speakers and sound work again. Go to Settings > General > Accessibility and scroll down to the section titled “Interaction.” Continue to scroll until you find Call Audio Routing. It should list “Automatic.” If not, adjust the setting to Automatic. However, if it already reads “Automatic”. Switch to Speaker mode. Then, make a call or Facetime. Verify that the speaker works. Once verified, change the setting back to Automatic. Use a small q-tip or another item to clean the area of the jack. However, if you do not have any item, simply insert and disconnect an actual headphone. Why Is My iPhone Screen Not Responding? How Come My iPhone Battery Keeps Dying So Fast? My iPhone Stopped Charging. How Can I Fix It? What To Do When My iPhone Does Not Turn On? My iPhone Gets Too Hot. What Can I Do? Do you have your iPhone X in a case? Then, there’s a chance that the case may be blocking the head jack. And, this, in turn, may cause your iPhone to think that there is a connected headphone. Firstly, swipe up from the bottom of your Home screen to open your Control Center. Then, tap the airplane icon. Now, turn the volume all the way down. Wait a few minutes (10) and then turn airplane mode off. Finally, check to see if your headphone problem no longer occurs. Alright, this is weird. However, by connecting your iPhone to a Bluetooth speaker or headphone, you reset the “wired connection”. Then, when you disconnect from the Bluetooth connection, you iPhone ought to go back to the normal sound mode. Wait, iPhone stuck in headset mode even after I tried all of the tips, what do I do? I recommend that you check for any iOS update. It could be a possible glitch. However, if after all the tips, your iPhone still says headphones when adjusting the volume, contact Apple support. How Do I Get Water Out Of My iPhone Headphone Jack? Did you spill water on your iPhone? Another common problem with the iPhone headphone jack that causes it to get stuck in headphone mode is the presence of water. Here’s a quick way to get your wet iPhone off headphones mode. Tighten the cotton swab around the Q-Tip to compress it in order for it to fit into the headphone jack of your iPhone. Once inserted into the jack, twirl it a few time to dry water or clear out dust. With the toothpick, gently pry into the headphone jack to remove other loose debris. Reinsert a fresh Q-Tip and re-do the first two steps. Finally, insert and remove your iPhone headphones a couple times to see if it goes into speaker mode. That’s all there is to fixing an iPhone stuck in headphone mode. Hopefully, one of the above methods helped you in some way. If not, you will need to seek professional help. Preferably a certified Apple Repair Center. 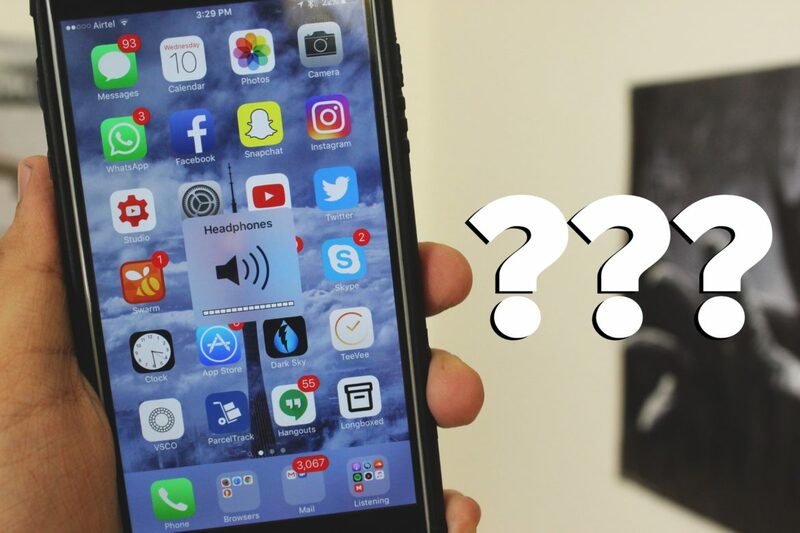 Video: What Do You Do If Your iPhone Is Stuck On Headphones Mode?